The gloves came off Tuesday as the six Democratic candidates vying to become the party’s gubernatorial nominee faced off in the first live televised debate of the election season. 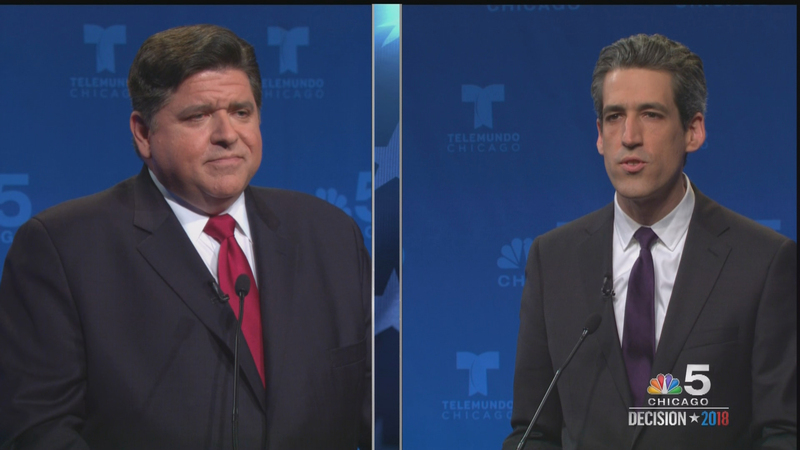 Pritzker primarily focused his attacks on state Sen. Daniel Biss, in part for touting his record on sponsoring and passing pension reform legislation. Moderator Carol Marin kicked off the forum by addressing the elephant in the room: the non-stop barrage of commercials featuring Pritzker caught on undercover FBI tapes discussing a possible job with former Gov. Rod Blagojevich. At Marin’s request for candidates to say something kind about one another, Pritzker praised Kennedy’s family’s involvement with the Special Olympics. Kennedy, however, couldn’t come up with anything to say about Pritzker. Marshall and Bob Daiber, Madison County Regional School Superintendent, both praised Tio Hardiman, the former director of the anti-violence group CeaseFire, for being honest and working in the streets to reduce violence. Candidates did agree on a question related to sexual misconduct. Marin asked whether candidates should publicly acknowledge being the subject of non-disclosure agreements relating to sexual misconduct, and if any of the six men on the stage had been the subject of such an agreement. Each candidate responded the same way: none has been the subject of such an agreement and all believe that when running for office, that information should be made public. Marin hosts a panel discussion Wednesday on “Chicago Tonight” about the governor’s race and the crowded field of candidates running for attorney general. Jan. 11: The Illinois primary is March 20, but you don’t have to wait until then to cast your ballot. Nov. 3: Illinois’ largest county – and the Democrats who run its politics – will work to get state Sen. Kwame Raoul elected as the state’s next attorney general. Oct. 31: Up to this point, it wasn’t certain that a challenger would emerge from the intraparty revolution Gov. Bruce Rauner ignited when he signed an abortion law in late September. There’s no ambiguity now.